Virginia's rolling hills, scenic shores and towering mountains are a haven for more than just outdoor enthusiasts and bucolic farms: The state's wine industry has boomed during the past few decades, with lush vineyards and nascent wineries sprouting up in nearly every region of the commonwealth. But how does Virginia's wine country stack up to California's Napa Valley, Washington state's Columbia Valley and other better-known U.S. wine regions? Connoisseurs say the vintages compare quite well, even as the industry faces challenges ranging from government regulation to the state's different climates. "It's almost been an explosion," said Dan Berger, a syndicated wine columnist in California who has covered Virginia's industry for the Los Angeles Times and the Associated Press. "The real message is things have changed and changed and changed, and Virginia is up there with some of the best wines in the country, and we should be recognizing that." 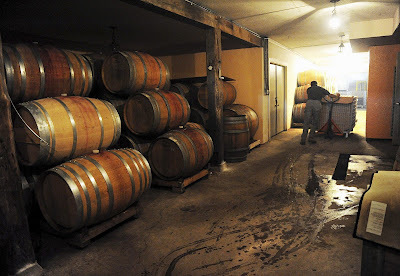 Since 1980, the number of wineries in Virginia has skyrocketed from about six to more than 130. The state ranked eighth nationally last year in commercial grape production, though it had just 50 acres of wine grapes in 1973. Mr. Law wheels a bin of just-bottled Chardonnay into the "cave" at Linden Vineyards in Linden, Va. 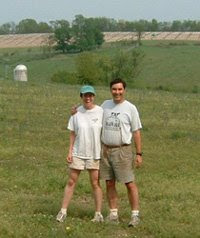 The vineyard and winery, nestled in the rolling green hills near Front Royal, was founded by Mr. Law in 1983. As the number of vineyards has grown, in-state winemakers say the quality of their product has risen dramatically as well - a claim they say is backed up by growing consumer acceptance. Jonathan Bess, owner of the Eastern Shore's Holly Grove Vineyards, bottled his first wines in May of last year. He won 15 medals in roughly nine months for his vintages, earning awards in international contests held in California and Indiana. The state's famed Barboursville Vineyards near Charlottesville also has won more than 20 gold medals in the last seven years for its hallmark Octagon blend alone. "Wineries, especially in the last 10 years, have really come a long way with growing quality," said Jonathan Wehner, owner of Chatham Vineyards, also on the Eastern Shore. "The flavors are made in the vineyard. People are really starting to do a great job of growing grapes." 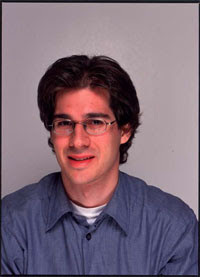 Carlo De Vito, a New Jersey-based wine writer and blogger who authored the book "East Coast Wineries: A Complete Guide from Maine to Virginia," said the state's wines now compare to the country's best in part because of the improving skills of those joining the industry. "You can find great dessert wines, you can find some great white wines in Virginia, and today you can find some wonderful red wines as well," Mr. De Vito said. "In a blind tasting, they would do very well against other red wines produced in the United States, no problem." In the September 30, 2008 Issue of Wine Spectator 10 Finger Lakes wineries recieved scores of 85 to 89 from the magazine. Here they are...by score. 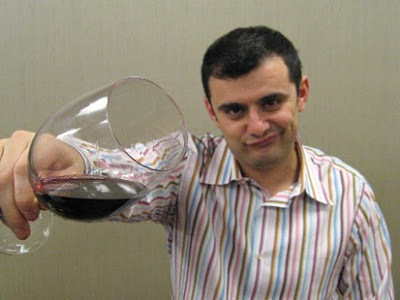 TIME RATES FIVE EAST COAST WINES "EXCELLENT"
Recently, Time magazine’s Joel Stien, and Gary Vaynerchuk, author of 101 Wines Guaranteed to Inspire, Delight and Bring Thunder to Your World (also an unrepentant Jet fan and video blogger) rated 50 wines from 50 States. The top finishers from the east coast with "excellent" ratings are shown here. I'm not sure why my instinct, upon learning that all 50 states make wine, was to try one from each. If I found out that every state has a water park, I wouldn't try to go to each one. That's because water parks can't get you drunk. But besides some patriotic call of duty, I think I wanted to try a wine from each state to see if, as I increasingly suspected, good wine can be made anywhere. Great wine keeps coming from surprising new places--New Zealand, Lebanon, Slovenia--so why not Nebraska? In 1976, as recounted in the new indie flick Bottle Shock, experts at a blind tasting in Paris were astonished to find they preferred California wines to Bordeaux. Would my experiment rearrange the wine world and create legions of devotees of Montanan merlot? And if so, would John Cusack play me in the movie? You can also watch these Huckleberries on the web as in true Vaynerchuk the video taped themselves drinking….there’s a few yucks…and even one Jets reference. New York Times and USA Today Promote "October Is Virginia Wine Month"
RICHMOND, Va. (AP) — October is Virginia Wine Month, with tastings, festivals and hotel packages around the state. Wine events around the state include the Mount Vernon Wine Festival, Oct. 3-5; the Norton Wine and Bluegrass Festival at Chrysalis Vineyards in Northern Virginia on Oct. 4-5; the Oct. 11 Black Dog Wine and Beach Music Festival at the Chateau Morrisette in Floyd; stargazing, weather permitting, with telescopes and the help of an astronomer the evenings of Oct. 17-18, at Virginia Mountain Vineyards in the Shenandoah Valley; Norfolk's Town Point Virginia Wine Festival, Oct. 18-19; and a Hot Air Balloon and Wine Festival at the Historic Long Branch plantation in Millwood, Va., Oct. 18-19, where 17 Virginia wineries will offer tastings. With more than 130 wineries and with eight wine trails, Virginia has something to celebrate when it comes to wine. And in October it will do just that with the 20th anniversary of Virginia Wine Month (www.virginia.org/wine). Events include the Norton Wine and Bluegrass Festival at Chrysalis Vineyards in Middleburg on Oct. 4 and 5, and a Hot Air Balloon and Wine Festival at Historic Long Branch in Millwood on Oct. 18 and 19. Several hotel packages are available, like Women Wild About Wine at the Tides Inn in Irvington, which includes lodging, two manicures and pedicures with wine, a picnic, and visits to six local wineries (from $335 per person per night, double occupancy); and Travel Back in Time at the Hotel Monaco Alexandria, which includes tickets to the Mount Vernon Wine Festival (Oct. 3 to 5), a tour of Mount Vernon, a picnic, and lodging (from $199 per night for two). New winery wins award with its 2006 Crumbling Rock Bordeaux Blend. A panel of experienced wine judges have tasted through flights of Maryland wine in the 19th Annual Maryland Governor’s Cup Wine Competition. This highly competitive judging is held each year to find the best wines from around the state. The top honor is the Governor’s Cup Award—the “Best in Show”—awarded to the wine with the highest overall score. 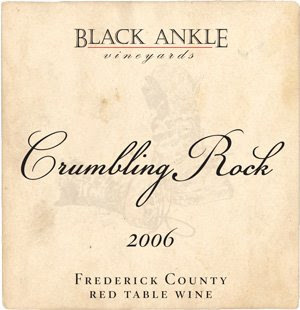 This year’s winner is the 2006 Crumbling Rock, a Bordeaux-blend from the new Black Ankle Vineyards in Mt. Airy. “What was really impressive was the number of gold and silver medals that were awarded. The quality of Maryland wine has improved significantly,” said Al Spoler, Director of the Governor’s Cup Competition. There were seven “Best of Class” awards presented at the competition, with Elk Run Vineyards and Boordy Vineyards each winning two. There were also 25 gold medals, 46 silver medals, and 47 bronze medals awarded. There are currently 34 wineries licensed in Maryland, according to the Maryland Wineries Association. These wineries—along with independent commercial vineyards—grow over 400 acres of grapes. Maryland wineries sold about 1.2 million bottles of wine in 2007, and their wines are available at over 800 retailers and 200 restaurants. “These vineyards and wineries and their long-term crops are good for the Bay, and great for tourism,” said Hannah Byron, Assistant Secretary for Tourism, Film, and the Arts. All of the award-winning wines will be showcased at this weekend’s 25th Anniversary Maryland Wine Festival at the Carroll County Farm Museum.